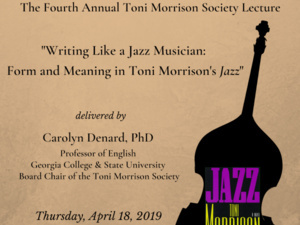 ‘‘Writing Like a Jazz Musician: Form and Meaning in Toni Morrison's Jazz’’ is topic of the fourth annual Toni Morrison Society Lecture. Guest speaker will be Carolyn Denard, PhD, professor of English at Georgia College and State University and chair of the society. Morrison, the Pulitzer Prize-winning author and Nobel laureate, wrote Jazz in 1992.